All you need are clean(ish) paintbrushes and water - plus I've added a little eco washing up liquid and a couple of drops of tea tree. 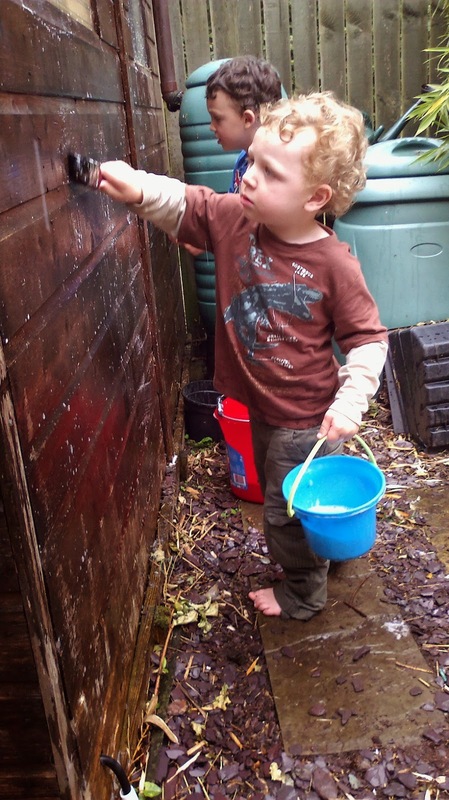 Our shed was covered in algae, cobwebs and chalk drawings so before I paint it with linseed oil to preserve it I thought it would be fun to get the boys helping to clean it by 'painting' it themselves. This activity, plus painting the patio and squirting everything with flower misters, kept us outside having fun for a good hour. This deceptively simple activity also works on teamwork, co-ordination and gross motor skills, plus gives a sense of achievement from working together with you to complete a game.